I have two friends who are each having twin girls in February and was invited to their joint baby shower this past Saturday. My first thought was, "Hooray, I get to make girl stuff!!" then my next thought was, "Oh goodness, I get to make 4 versions of everything!" 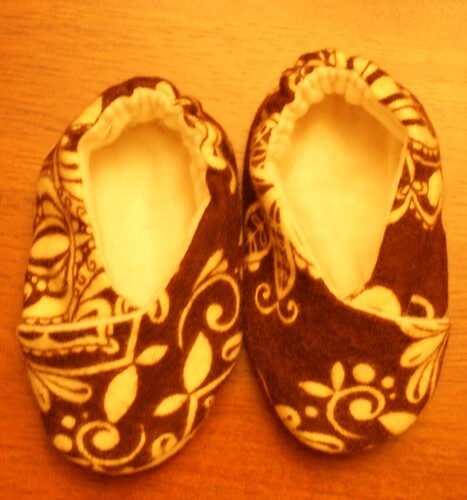 As if that wasn't scary enough, I decided I wanted to make Homespun Threads' Kimono Baby Shoes because I had pinned them ages ago before I knew if I was expecting a boy or a girl. 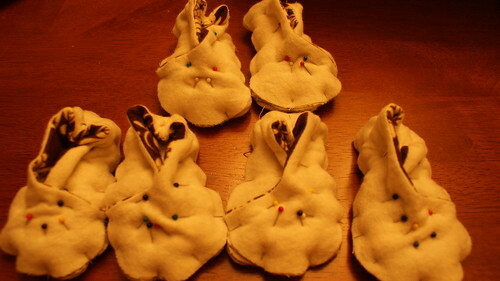 This now meant that I wasn't just making 4 versions, I was making enough for 8 tiny little feet. As you can see, this pattern gets around, I spotted them on another blog which appropriately pointed back to Homespun Threads. I took Vanessa's advice about adding elastic to the back. I'm going to include instructions here on how to alter the Homespun Threads' pattern/tutorial to include elastic. First, read through and print the pattern. 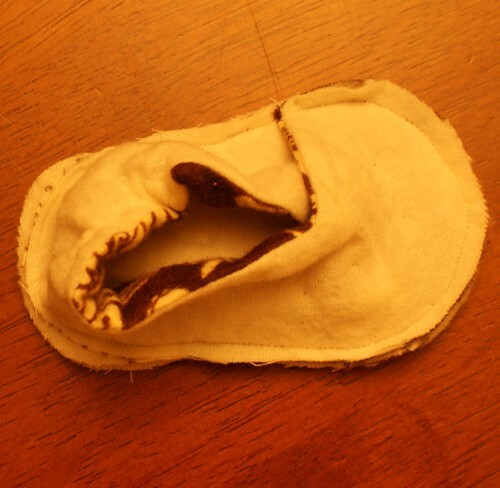 You'll also need one 2-inch long strip of 1/4 inch wide elastic for each shoe you create. 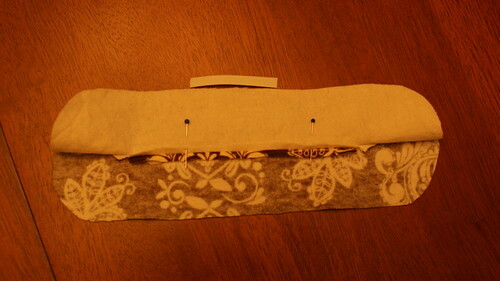 3a: Clip the corners and press the seam flat then press the pieces with wrong sides together. Take a moment now to trim off any excess if your lining and outside pieces don't match perfectly. You REALLY want them to match perfectly before moving on. 3b: Open the 2 pieces back up again and mark the center. 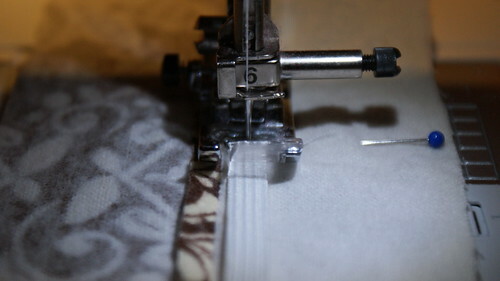 Now set pins to 1.5 inches on either side of the center. 3c: Place one end of the 2 inch piece of elastic on the seam allowance of the lining piece (be careful not to invade the seam) at the pin and straight stitch along the center of the elastic while stretching it to the other pin. You can now step back to the original instructions at step 4. I will say though that rather than sewing it once one way and then the other way as she suggests, I found it easier to just pin the entire upper to the sole and sew around the entire thing. 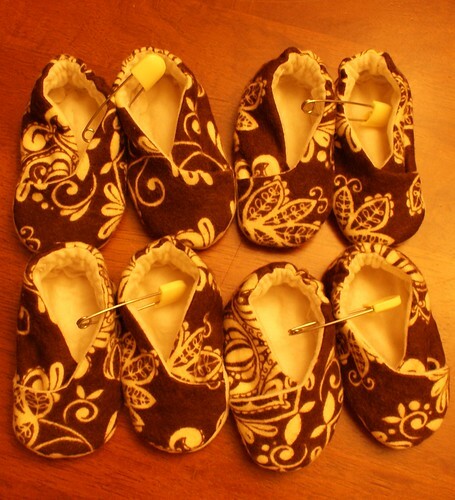 Here are 6 shoes all ready to hit the machine for their final stitches. I worked the kinks out of the elastic process with the first pair of shoes then zipped right through the other 3 pairs. Thank you for the pattern Homespun Threads!! Vanessa - Thank YOU for suggesting the elastic. I'm glad I found your post first so I could take your advice. Happy Thanksgiving to you too! Yes my son would love it! !Your article on this blog is fantastic. Well done! I’m a big fan of your blog and be sure to keep up the great work.